Grease Monkey and Monkey Shine are complementary franchise concepts that work well together from a business perspective. 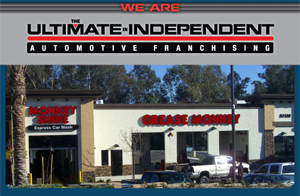 Franchisees can choose to operate stand-alone Grease Monkey or Monkey Shine centers, or develop side-by-side Grease Monkey and Monkey Shine centers. Grease Monkey and Monkey Shine have franchise opportunities in major markets across the country. If you share our passion for providing superior customer service while building an outstanding brand name, we invite you to start the process towards becoming a franchisee with us today. Grease Monkey and Monkey Shine have developed industry-leading franchise systems to consistently provide a superior level of service in the preventive automotive maintenance segment. The Grease Monkey and Monkey Shine platforms are designed to guide franchisees in all aspects of running their quick lube and car wash businesses. From site selection, construction and initial training to ongoing training, marketing and operations, our systems provide an unparalleled level of support throughout the franchise relationship. We are Grease Monkey and Monkey Shine, together raising the standard in independent automotive franchising. Both brands currently have major opportunities available nationwide. Over Grease Monkey's 30-year history, we have built a reputation as one of the nation's most reputable quick lube franchise concepts. We provide a high level of service, professionalism and environmental stewardship. Monkey Shine is poised to become the first brand name car wash company with a nationwide presence. With the Monkey Shine franchise concept, we are revolutionizing the in-bay automatic and express car wash segments. Grease Monkey is the only major quick lube concept that is not owned by an oil company. While we negotiate pricing and make recommendations for Grease Monkey franchisees, we do not dictate what products or supplies franchisees must use. Monkey Shine is the first car wash franchise that is run by a franchise company, not an equipment manufacturer or distributor. We have spent years assessing the hundreds of car wash equipment options to identify the best providers, with whom we have negotiated special pricing and extended service packages for our franchisees. Click on Request Information button above for FREE information on how to start a Grease Monkey franchise today! Please Note: Grease Monkey franchises for sale, and other franchise opportunities, business opportunities, businesses and franchises for sale on this web site are not to be considered as an "offering", "franchise offering", suggestion or recommendation by GlobalBX. The franchises, businesses and business brokers seen on this web site submit their own individual content. This advertisement depends entirely on the truthfulness of the information provided by our advertisers which includes, but is not limited to, franchisers, franchises, franchise brokers, franchise consultants, business sellers and business brokers. As always, GlobalBX recommends that you consult a lawyer, financial consultant, accountant or professional advisor before buying a franchise or business opportunity or any type of business. By submitting this form and requesting more information, you have agreed to all terms and policies of GlobalBX and the business and franchise offerings listed here. Please review our Terms & Conditions for more information.